Organize business meetings on the cloud, accessible from any device. Instead of email and phone call hassle, Meetin.gs takes care of finding a suitable time and providing participants a persistent meeting page for communication. The service keeps participants up-to-date and on the same page, synchronizes your calendar and sends beautiful meeting summaries. Meeting timeline and mobile apps provide an easy and quick way to catch up before an important meeting. Meeting Timeline makes it easy to browse past and upcoming meetings and meeting related tasks. Meet Me pages enable users to create and publish personalized calendar pages to make it easier to schedule a meeting time. The individually branded page automatically blocks out occupied time slots based on the user’s calendar and allows the meeting location and duration to be pre-defined as well as preferred transit times between meetings. Meeting analytics for insight into your meeting habits: time spent on meetings, materials & comments shared and number of meetings organized. Mobile site and apps to access meeting information on the go. Users can easily see meeting time, location, participants and view any materials attached to the meeting and even join a Skype conference call. Tired of looking up contact information, opening up email and sending the invitation? Have you searched your calendar too many times to suggest a suitable time for a meeting? 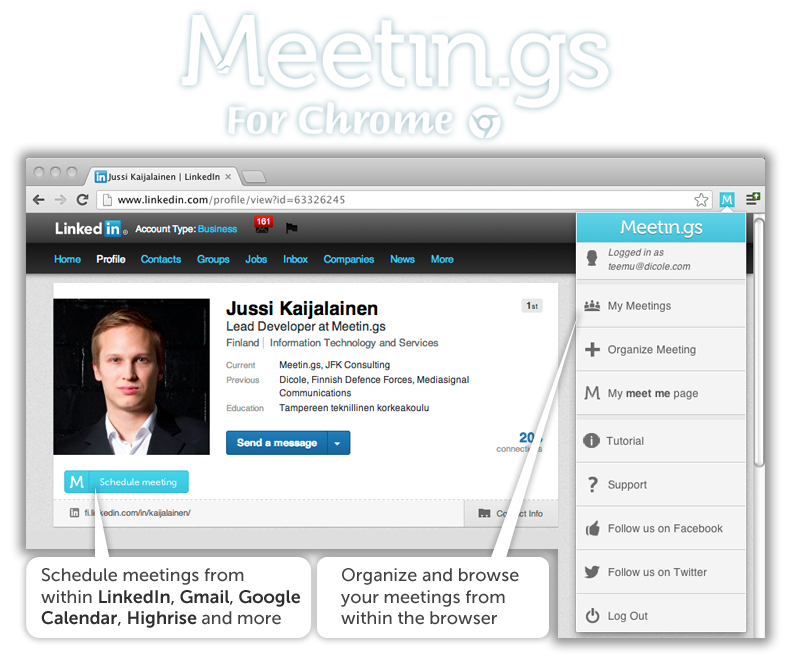 With the Meetin.gs Chrome browser extension for scheduling and organizing meetings reduces the hassle and saves you time. As a bonus, it also makes you look smart and well organized. Schedule Meeting button to some of the top business tools and services: LinkedIn, Google Calendar, Gmail, Highrise, with more to be added later. The button allows one to instantly schedule a meeting with all the relevant information extracted from the third party website. Meetin.gs menu on the toolbar for easy access to Meeting Timeline, Meet Me page and a quick way to organize a meeting with people from your address book. You get an email from a potential customer who wants to meet. Instead of browsing your calendar and manually sending suggestions for meeting times you save everyone’s time and click the “Schedule Meeting” button next to the email in Gmail. The customer will receive a meeting invitation with the ability to pick the available time for an online or face-to-face meeting. Next you approve the meeting invitation, add the agenda and some materials about your products and services and invite your colleagues. Everyone receives a calendar item that will be automatically added to their calendars. A day before the meeting the parties also receive a reminder email with the meeting agenda and materials attached. During the meeting they can use Meetin.gs to access the meeting materials, take notes and even join the Skype conference call if available. The next day they receive a beautiful meeting minutes and next action points. Similarly, when you are browsing profiles on LinkedIn you can propose a meeting to any of your contacts without any email hassle. Selling and being organized around business meetings has never been that easy! Organize a meeting right from the service where you and your customers spend most of their time thinking about organizing meetings: email, calendar, social networks and CRM. Gmail: Schedule a meeting with anyone who sends you an email. Google Calendar: schedule a meeting or export an existing calendar item as an online meeting page. Highrise: Schedule a meeting with anyone in the contact registry. More to come: what services would you like to support? Let us know at the support forums. Once you click on the “Schedule meeting” button we will guess some of the meeting details such as title and meeting participants. The details will be exported to Meetin.gs where you get the opportunity to edit the agenda, add materials and add anyone else on the invitation list who should be participating. You can also choose if the meeting will be online e.g. on Skype or at a specific physical meeting spot. Once you are ready, click “Ready”, edit the invitation letter and the participants will receive the calendar invitation as well as a link to access the online meeting space. Choose the “M” next to the Chrome address bar to access your meetings at any time and also to connect your calendar. Install the extension by clicking the button above. A Meetin.gs menu (M) will appear on the right side of the address bar. You can now register/login, organize and manage meetings from the (M) menu. You can quickly schedule a meeting with the Schedule Meeting button by opening an email in Gmail, accessing a calendar item on Google Calendar, browsing a lead on Highrise or viewing a profile on LinkedIn. If you need any help or have any feedback, support is available on the (M) menu.